are carefully made, using rare materials. The representation of literal shapes, as in these earrings, is a new direction in the use of diamonds. The diamonds are gathered one by one, and the conception is realized only after all the pieces that will make up the body have been collected. Totally by hand, the platinum settings are made to fit the diamonds, then assembled and finished. All the while, the balance of the earrings must be checked as well. The actual style of the finished earrings depends on the diamonds that the producer was able to gather. In the earrings on the next page, the wine glass in the earring on the right appears to contain red wine, represented by a ruby that is visible from slightly above. A round diamond in the glass of the left earring represents white wine. Fancy shapes are appreciated for their characteristic beauty and, as in these earrings, for the effects they produce when used in combination. However, it is often difficult for makers to find the fancy-shaped materials needed to make the jewelry they have in mind. Since tapered baguettes and other fancies are polished according to the form of the rough diamonds, each has a unique shape and size. Thus, matching fancies are hard to find, especially in diamonds with widths over three millimeters. The size of rounds and squares can be sorted simply by diameter or the length of one side, respectively, but baguettes need to be sorted by length and width. While the chance of finding usable sizes is ideally one in four, realistically it can be as low as one in ten. In the case of tapered baguettes, marquises, and pear shapes, the need to consider the degree of tapering or the curvature of the outline reduces the odds by another factor of ten, making the rate of occurrence of these diamonds in usable shapes and sizes about 1/100 that of rounds. Beautiful jewelry containing fancy shapes is limited and extremely rare. 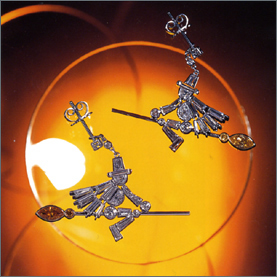 The earrings below feature a charming witch motif, with yellow diamonds at the ends of the broomsticks creating a sense of motion. It looks as if the witches are actually darting about through the sky on their magical broomsticks. Perhaps the person who wears these will also be able to soar freely.